Who’s gonna be your enemy? When it’s the price you pay? Joshua Ketchmark returns with the alt-rock infused EP “The Ignited,” his third and final EP release of the year on October 30th, 2012. Staying true his raw and authentic quality, Joshua shines as he returns to the rock genre, his gritty vocals and remarkable songwriting are peppered with a steadfast mainstream quality, leaving no doubt that “The Ignited” will stand-out among his critically acclaimed previous releases. Produced and engineered by Davey Julson Rieley (Kill Hannah, Kelly Clarkson, Elvis Costello) along with engineer Jeremy Hatcher (The Used, Black Veil Brides) the album is brilliantly chiming, with anthemic songs of real restraint and grace that include a little bit of everything, from a thrashing fire of the drums to the invigorating melodies. The perspective of this record comes from a man that’s been hurt and heartbroken, a bitter and angry voice that allows itself to be exposed and wavering throughout each track; a true departure from his previous release in all the right ways. Each aspects comes together to make for a radio ready alternative rock album that could easily find itself among the likes of the Foo Fighters, Hinder, and Paramore. The opening track, “About to Break” is a gutsy fist-pumper, Joshua’s wail of a voice yells out over each chorus on a justifiably pissed off vocal track. It’s a mix with a welcome focus on the drums, though it manages to remain melodic despite the exhilarating track that hammers on from the opening chord to the explosive finish, brandishing a real heavy-metal esque moment. Next up is “Fallen,” its pleasingly quirky instrumentation and a bouncy, visceral pop rock arrangement make it a standout track. Joshua’s vocals add a glistening charisma despite the content of the lyrics, an upbeat break-up song that somehow manages to add a sense of fun to the keenly emotional content. If “Fallen” is something of a break-up anthem, “Hurt” is where the sadness turns to bitterness, full of biting lyrics that express caution and remorse, its energetic chorus gives way to a raucous, emphatic beat that stands out beautifully and quickly becomes a staple throughout the album. The melody is lifted by the intoxicating sound of Joshua’s voice, who only manages to add the gritty emotion in an almost effortless fashion. The first single off “The Ignited,” is the ethereal “Without You.” It is a collision course of sound that is both dissonant and enthralling, all married together by a strong, vigorous vocal lift that shines brightly as the centerpiece when the chorus builds to a riveting emotional place. It’s the last breath of a dying relationship, desperately trying to thrive in a barren place, and you feel the frustration and desperation in each raw high and low of the vocal. Joshua Ketchmark‘s talent sits at the forefront of “The Ignited,” from the rich tone of the guitar to his uninhibited vocal prowess, made more powerful by the stunning instrumentation. There is no question that his ambitions match his abilities, which will surely allow his music to find a place in the collections of any music fan and find himself a definitive place in the spotlight. Be sure to grab a copy of “The Ignited” on October 30th, 2012! ‘The Ignited’ is Joshua Ketchmark’s third release of 2012, concluding a trilogy of EPs showcasing the Tennessee-based singer-songwriter’s many facets. Following the power pop-ish ‘The Bittersweet’ and the wonderful, alt-country infused ‘The Dreamers Disease’, ‘The Ignited’ offers four energetic alt-rock tunes and presents the louder elements of his sound. The opening track ‘About To Break’ is also the edgiest, as it powers ahead with some serious staccato riffing. The most alt-rock tune in Ketchmark’s EP trilogy, it firmly sets out his intentions, while his technical team of Davey Julson Riley and Jeremy Hatcher (best known for their work with Elvis Costello and Black Veil Brides, respectively) bring the song to life with a very crisp studio sound. Ketchmark attacks his lyric with a suitably sneering (slightly drawled) performance, while the rest of his band goes all out. There’s a rumbling bass which isn’t too high in the end mix (it really should have been pushed upfront); to make up for this, the drums attack in a fashion rarely heard on Ketchmark’s previous outings. In all, it’s a bit trashy, but a fine way to kick things off. A fine balance between rock edge and pop sensibilities makes ‘Fallen’ shine. Ketchmark is in strong voice throughout, but it is only really with the chorus this one really grabs. A simple hook line and some soft backing harmonies are on hand for a full radio-friendly sound. Treading on Butch Walker’s coat-tails with its blend of pop/rock and alternative edge, you should be able to have a guess at how this sounds. While you’ve heard it all before – and many times, no doubt – if tuneful, slightly alternative rock is your bag, this should greet your ears somewhat favourably. Despite its predictable nature, ‘Fallen’ is ‘The Ignited’s recommended listen. ‘Hurt’ works on a little too much of a tried and tested formula, but if you can accept that there’s nothing new here, like ‘Fallen’, it’s got a pretty decent heart, even if it doesn’t always quite reach the stratospheres it’s aiming for. Hook-wise its strong, but musically it is a mixed bag: the pounding drums and rhythm guitars are enjoyable enough, but the guitar solo isn’t much more than a rudimentary offering. If Ketchmark had pulled out the stops on the lead guitar front, it could have, perhaps, been a match for ‘Fallen’, but as it is, it’s okay. While it is obvious to see why Ketchmark has chosen to end his trilogy here – very much on a rock-fuelled, mostly upbeat note – it’s not necessary the sound of a musician going out with all guns blazing, especially in comparison to his previous EPs. There are some very enjoyable moments throughout, but these four numbers are not always loaded with of the kind of fireworks they could have been. These songs would’ve, perhaps, had a much greater appeal if he had chosen them to open the trilogy instead…but after ‘The Dreamers Disease’, ‘The Ignited’ sounds like a musician playing for safety. That’s fine of course, but as a parting statement from a body of work slowly unfolding over the course of a year, this EP should have been more than that. Here is the rock hard truth and it isn’t all that bad. 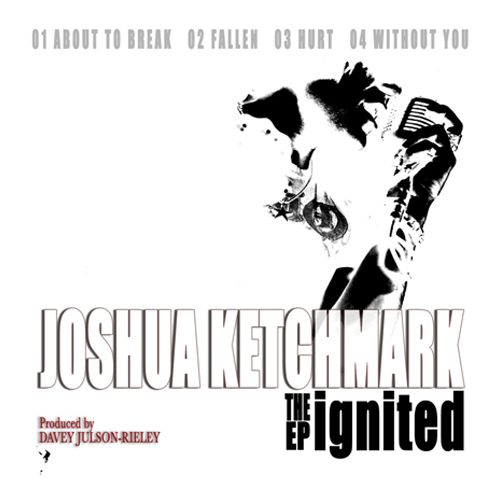 Joshua Ketchmark´s 3rd EP in 2012 is called “The Ignited” and will be out on Oct 30th, it´s produced by Davey Julson-Rieley who has worked with Kill Hannah, Kelly Clarkson and Elvis Costello. These 4 new songs are really good and a cool blend of powerpop and modern rock, Joshua Ketchmark even takes a visit in AOR land on “Hurt”. The opener “About to break” is more of a contemporary modern rock song and also perfect for active rock radio, my favorite though is the smart rock of “Without you”. Such lovely harmonies in this song where my thoughts go to Ken Andrews. Highly recommendable! There was a time when musicians sold millions upon millions of oil-based vinyl, aluminum covered plastic and magnetic tape copies of their music. Back then bands hoped to break even when they toured. The purpose of playing in public was to promote store sales of their latest recordings. Record companies underwrote extravagant live shows and positioned bands in multi-band line-ups, on National and International tours with the bands as guarantors of the costs associated with the once every year or so promotion of this year’s album. With ticket sales the bands and record companies hoped to cover their out of pocket costs. The margin on recording sales was such that a few hundred thousand sales could provide a band with subsistence income if it toured on the cheap. Millions in sales meant the rock and roll lifestyle that, if prudently invested, could last a lifetime. It doesn’t work that way anymore. Digitization and file-sharing changed the formula. It became easy to copy and exchange music and album art. Musicians seized upon the opportunity to work unencumbered by obligations to record companies and tried to reach a wider audience. Free music proliferated beyond TV, radio, satellite and cable music offerings to include a vast variety of internet radio stations, music sharing, and free and paid music download sites. With so many new ways to obtain music, music sales declined, and so did band and record company profits. The technological changes created a new market paradigm. Musicians could no longer afford to break even on a tour. They needed to make a significant profit. The number of consumers who bought music had shrunk. Yet, the number who listened to music hadn’t changed. There were two other transformations due to digitization. The cost of distribution virtually disappeared. Once a band made a digital copy it could be downloaded infinite times without the cost of pressing, plastic, paper and packaging. Thus, it no longer takes hundreds of thousands of pressings to make a profit. It only takes a few thousand downloads. In addition, the cost to market one’s music was significantly reduced. One digital press release now extends to the far reaches of the earth with a click of a button. Atlantic, Capitol, CBS, Sony and other mega-entertainment labels started swallowing each other up in buy outs and mergers to remain profitable as the ability to do what they used to do became easy and the cost to do it became cheap. Thus, small record companies and artist-owned labels have proliferated. It may only be five tracks but, damn, what a sweet five tracks. This three piece London-based band turns out some of the catchiest acoustic alternative/folk music around. Charlie Ferriday plays a beautiful folksy six string to accompany his smooth lead vocals. Stuart Connick is a beat master, providing wonderful drumbeats, percussion and harmony. Roger Connick mans the bass and offers backing vocals. They gig about the U.K., but with efforts such as Somewhere In Between I suspect they are likely to find a much wider audience. This ensemble has been called “SF’s loudest folk band.” Their self-titled ten track album is an amalgam of sophisticated garage folk punk rock. The band will play with your senses and rock you into psychedelic ecstasy. Nic Abodeely provides the vocals and plays guitar alongside guitarist Jordan Villa. Nate Ricker rocks the keyboards and strums a mandolin. Dan Burns is the bassist and Landon Cisneros beats the skins. They play all over the City, provide a high energy show and, in true San Francisco style, embrace the, ummm, unlimited variety of the Bay Area arts and body parts scene. Classic rock is not dead. It burns bright in Joshua Ketchmark and you will catch fire listening to his upcoming four track EP The Ignited. Ketchmark leads guitarist Christian Martucci, bassist Carl Raether and drummer Zak St. John through original anthem worthy rockers. Although based in Los Angeles you are just as likely to catch Ketchmark in Nashville or Knoxville, TN or on the road in the U.S. after this EP is released on October 30, 2012. You might want to save a few semolians for tickets and get your torches ready. So, there you have it. The new musical paradigm. Where do we go from here? Well, the next new wave is already on its way. Some call it “predictive music” – music tailored to the consumer’s specific mood, desire, liking, and created by the consumer’s thought, choice and unconscious desire. Not just a playlist, the consumer will generate the sound that, at that specific moment, gives her or him the utmost pleasure. Then, through our need for shared experience each person will share their personal creations to let others participate in, and experience, their muse. If it rings true to many it will ebb and flow around the world in the form of unique electric impulses. It is Ripple Music. Rounding out a trio of EPs released this year, modern rocker Joshua Ketchmark delivers “The Ignited,” October 30th. Not to slight the other two excellent EPs (reviewed here), but it seems Ketchmark has saved the best for last. These four tunes all have bite and grab at your attention span greedily, exuding a commercial appeal that ranks them as some of the more radio-friendly songs he’s written to date. With help from Davey Julson Rieley (Kill Hannah, Kelly Clarkson, Elvis Costello) as producer and engineer, along with engineer Jeremy Hatcher (The Used, Black Veil Brides), “The Ignited” is a sonic treat. The perspective of this record comes from a man that’s been hurt and heartbroken. “The Ignited” begins with the rousing track, “About To Break” – an instant anthem sure to get your blood pumping. The break-up song “Fallen” easily glides into Foo Fighters-territory and is likely to become my favorite in the bunch. The markedly darker tone of the gritty “Hurt” provides a good example of the contrasts Ketchmark is skilled with juggling. Be sure to wait for the chilling note he holds 2/3’s of the way through. He concludes with “Without You”, the first single. One of the more ambitious songs in the Ketchmark catalogue, “Without You” attempts to merge moody verses with a more accessible chorus. A decent track, but not the best one here in my opinion. Be sure to get the song “Without You” for FREE over at his web site right now! Recommended for fans of Foo Fighters, Hinder, and Paramore. Joshua Ketchmark returns with the alt-rock infused EP “The Ignited,” his third and final EP release of the year. Staying true his raw and authentic quality, Joshua shines as he returns to the rock genre, his gritty vocals and remarkable songwriting are peppered with a steadfast mainstream quality, leaving no doubt that “The Ignited” will stand-out among his critically acclaimed previous releases. Produced and engineered by Davey Julson Rieley (Kill Hannah, Kelly Clarkson, Elvis Costello) along with engineer Jeremy Hatcher (The Used, Black Veil Brides) the album is brilliantly chiming, with anthemic songs of real restraint and grace that include a little bit of everything, from a thrashing fire of the drums to the invigorating melodies. The perspective of this record comes from a man that’s been hurt and heartbroken, a bitter and angry voice that allows itself to be exposed and wavering throughout each track; a true departure from his previous release in all the right ways. Each aspects comes together to make for a radio ready alternative rock album that could easily find itself among the likes of the Foo Fighters, Hinder, and Paramore. The opening track, “About to Break” is a gutsy fist-pumper, Joshua’s wail of a voice yells out over each chorus on a justifiably pissed off vocal track. It’s a mix with a welcome focus on the drums, though it manages to remain melodic despite the exhilarating track that hammers on from the opening chord to the explosive finish, brandishing a real heavy-metal esque moment. Next up is “Fallen,” its pleasingly quirky instrumentation and a bouncy, visceral pop rock arrangement make it a standout track. Joshua’s vocals add a glistening charisma despite the content of the lyrics, an upbeat break-up song that somehow manages to add a sense of fun to the keenly emotional content. If “Fallen” is something of a break-up anthem, “Hurt” is where the sadness turns to bitterness, full of biting lyrics that express caution and remorse, its energetic chorus gives way to a raucous, emphatic beat that stands out beautifully and quickly becomes a staple throughout the album. The melody is lifted by the intoxicating sound of Joshua’s voice, who only manages to add the gritty emotion in an almost effortless fashion. The first single off “The Ignited,” is the ethereal “Without You.” It is a collision course of sound that is both dissonant and enthralling, all married together by a strong, vigorous vocal lift that shines brightly as the centerpiece when the chorus builds to a riveting emotional place. It’s the last breath of a dying relationship, desperately trying to thrive in a barren place, and you feel the frustration and desperation in each raw high and low of the vocal. Joshua Ketchmark‘s talent sits at the forefront of “The Ignited,” from the rich tone of the guitar to his uninhibited vocal prowess, made more powerful by the stunning instrumentation. There is no question that his ambitions match his abilities, which will surely allow his music to find a place in the collections of any music fan and find himself a definitive place in the spotlight. Be sure to grab a copy of “The Ignited” out now.